We use your forms for calculating on our homepage. I did not change anything but today I received a client's call, that they don't work properly. Unfortunetaly he was right, the calculation always shows the minimun price or the hint which is shown when the measures are too big. What happened??? So from what I understand of your above issue you mean that your form fields and calculations aren't showing correctly? I've noticed that on this page here http://www.jacobs-metallbau.de/?section=kalkulation you appear to have three separate forms. Is that the right page with the form or forms for this issue? If so then are all three of them experiencing the same issue on your end or just one? Could you please provide us with more details explaining where it leads up to this issue and which form this is happening on as an example so that we can better investigate this issue? the problem suddenly appeared at all three forms on our page. Yesterday I tried to find out what happened and also in preview of jotform they don't work any more. And I have no idea what happened as I haven't even been logged in before. Our clients can calculate steel plates and profiles with these forms. 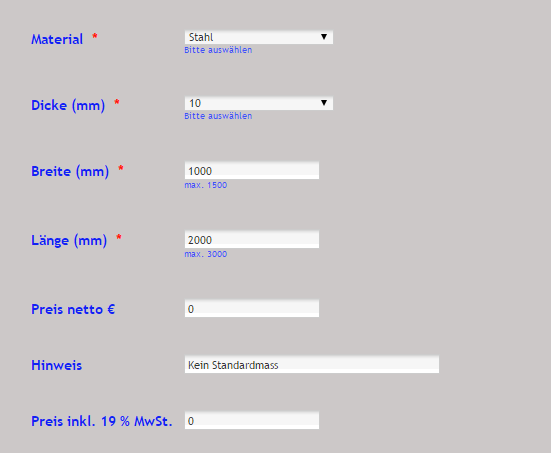 If you open the first form "Scherenzuschnitte", please fill in for example "Stahl" "10" Breite="1000", Länge="2000". Some days before the first price shown was "360", which is the result we wanted. Now there is shown the hin that this is no standard measure. If you fill in low measures like "100" and "200" the price shown will be "5", which is the minimum price. It was built up the way, that the weight auf each plate will be multiplized with different factors (Dicke x Breite x Länge x 0,08 x differing prices). Minimum price of 5 € and the "Hinweis" = "kein Standardmass" if the clients chose too big measures. Thanks for checking and you help! I am currently checking your form. Please give me more time to check this. I will get back to you as soon as I get a result. 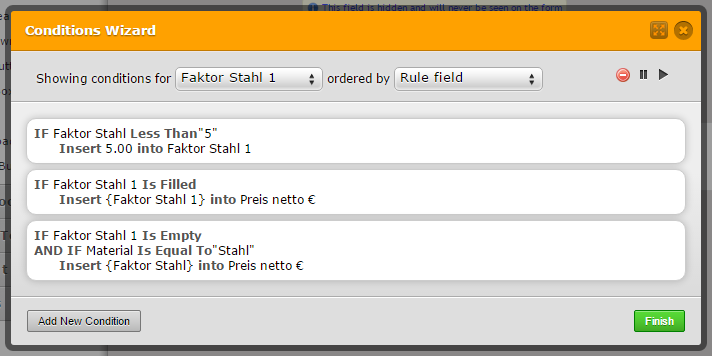 I checked your form and I tried the setup you have mentioned and I can see that the Preis netto € value is 0 and the Hinweis field is displayed. The field is dependent to Faktor Stahl 1 field which is a hidden field. As per checking the Faktor Stahl 1 field, the value set for this field is 0 (default value) or 5 only. The only condition set for the field to update its value is this: If Faktor Stahl field (another field that has a computation) is less than 5 then insert 5.00 to Faktor Stahl 1 field. So if Faktor Stahl field is greater than or equal to 5 then the value for Faktor Stahl 1 field is 0 (default value). 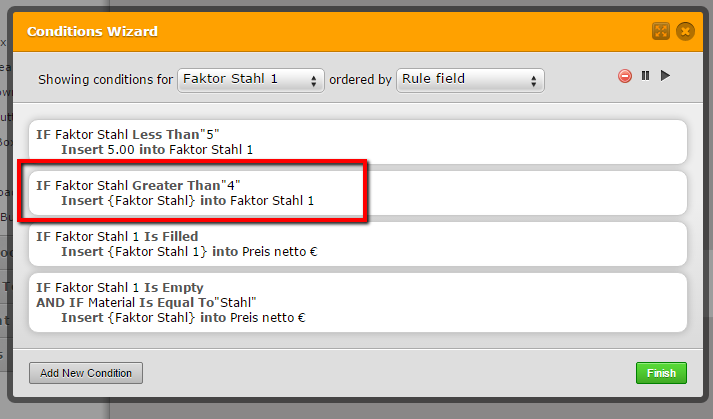 Can you try to add another condition to update the value for Faktor Stahl 1 field as shown below? I also noticed this setup for verzinkt 1 and Corten 1 field. You may also try to add the condition for the said field. By the way, the link of your form that I have checked is this one - http://www.jotformeu.com/form/50411879347359. I have no idea waht happened but I followed your suggestion and it works properly again. 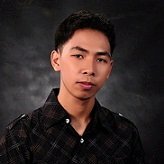 Thank you so much for your fast help!!! JotForm is just doing a great job!!!! Thansk! You are welcome. I am glad it work fine now.